This is a powerful reminder of the grim injustice (in the name of 'justice') ideologues can wreak. Well, not quite where we started from. That'd be zero. But back where we started from when National took govt. The slow total decline continues. Down to 9.9% of the working age population. There's a blip with JobSeeker support but nothing dramatic or necessarily trendsetting. It may be saying something about the employment situation. 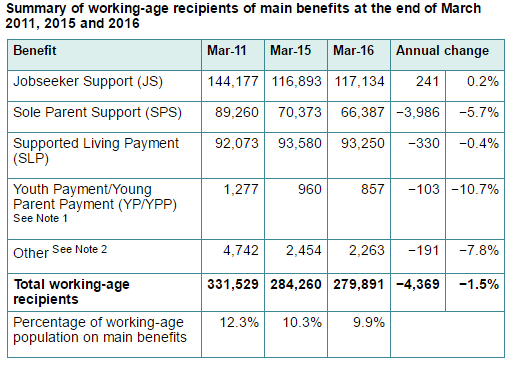 It might just be ageing single parents being moved onto Jobseeker support. 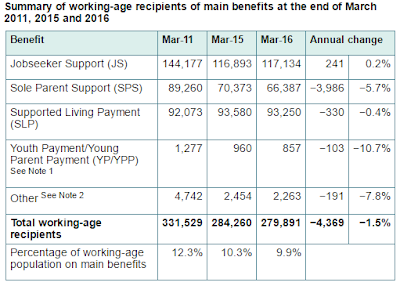 Little to be inferred by the reduction in YP/YPP for 18+. The teenage birth rate is dropping so perhaps unsurprising. 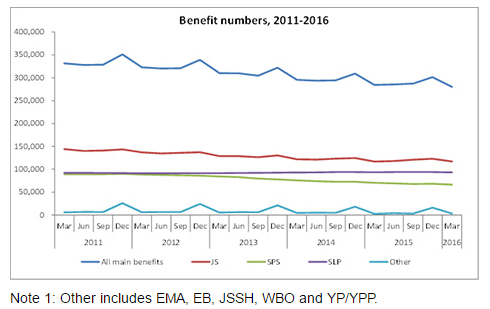 The old invalid benefit - Supported Living Payment - remains stubbornly high though any reduction is unusual compared to the past few years. Reliance on welfare due to psychological conditions continues to grow. The Sole Parent Support reduction is the biggest and best news leading to fewer children on benefits. I don't see any smoking gun in the data tables. Total numbers are dropping. Just not fast enough for some readers. Or me. As the drop is post GFC it's worth looking where we were pre GFC. At 9.9% of the working age population. (The Super numbers are the big growth area and while most people don't think of it as a benefit, it's included in the tables. From a piece in this morning's DomPost about junk science by Matt Ridley (British journalist and Conservative MP), prompted by Robert De Niro joining into the anti-vaccine brigade. "Instead of evidence-based policy making, pseudo-science specialises in policy-based evidence making."